You may have heard of the documentary film “The Principle” written and produced in the US by Rick deLano, which is to be released in the Spring of 2014. It features interviews with a line-up of notable cosmologists including Michio Kaku, Lawrence Krauss, and Max Tegmark. Many are big bang cosmologists who support the standard paradigm, whose proponents hold to a worldview which assumes there is no privileged frame of reference in the Universe. Others interviewed hold to alternate cosmological worldviews, notably those who hold to the idea that the Earth is in a privileged place in the Universe. The Creator of the Universe has a personal name. His name written in Hebrew goes back to ancient times. 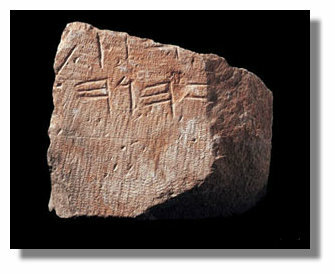 Here (on the top left) is it written in Paleo-Hebrew but in modern Hebrew it is written like this on the bottom left. You can see the changes the script has had over time, but this is what happens with language. God’s personal name is often Romanised as YHWH, YHVH, Yahweh or Jehovah. The 4 letters in Hebrew are called the Tetragrammaton. God’s name was not allowed to be pronounced by the Jews – instead they pronounced the word as Adonai, meaning Lord. But the literal meaning of God’s name is “the existing One” or the self-existent one. This is what God said himself— “I AM”— means to just be.